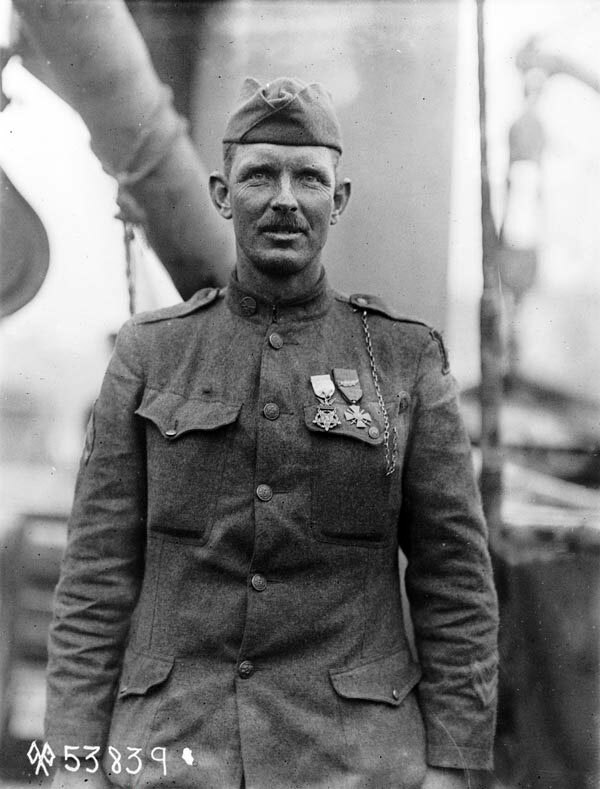 On 8th October 1918 an American soldier, Corporal Alvin C York from Tennessee, carried out one of the most remarkable acts of single-handed bravery in the whole of World War One, or possibly any war, come to that. At dawn on 8th October 1918, Corporal York’s platoon of the 328th Infantry Battalion was in trouble during an operation in the Argonne Forest of north-eastern France. They were under heavy machine-gun fire and taking casualties. A detachment of 17 men, including York, were determined to do something about it and found a way of getting to the rear of the machine-gun nest from which all the fire was coming. However, once the Germans were aware of what the Americans were doing they swung round to attack York’s detachment, and six of the Americans were quickly killed. York was now the most senior man left and he took it upon himself to make use of his sharpshooting skills and save the situation. With more than 30 machine guns in the nest, York had to be accurate with his shots, and he was. Every time a gun swung in his direction a German head was exposed for a brief moment, and York fired at it, never missing once. The Germans then tried a different move, namely jumping out of their trench and charging at him with fixed bayonets. York used his automatic pistol to take the Germans out one at a time, making sure that he shot the man nearest to him, so that each man leaving the trench would not be aware of the danger he faced until it was too late – he wanted them to keep charging rather than dropping down and shooting at him. Eventually the Germans gave up and all the remaining soldiers surrendered to him. In one morning Corporal York had killed 20 German machine-gunners, put 35 of their guns out of action and captured 132 men. For his action he was promoted to sergeant and awarded the Medal of Honour (the American equivalent of the Victoria Cross), which he received from the hands of General Pershing.